The purpose of this study is to create a GIS based approach for identifying undeveloped and underutilized nonresidential sites near critical water resources (such as drinking water) and determining whether such sites are more appropriate for economic development, open space preservation or a combination of both. In doing so, the study seeks to develop a model that protects water resources while improving local economies. Base maps of critical areas in the Lower Raritan Watershed Management Area are presented, as is a comprehensive inventory of priority sites in the Somerset Regional Center. Case studies are offered which illustrate design alternatives on two high priority sites within the study area. 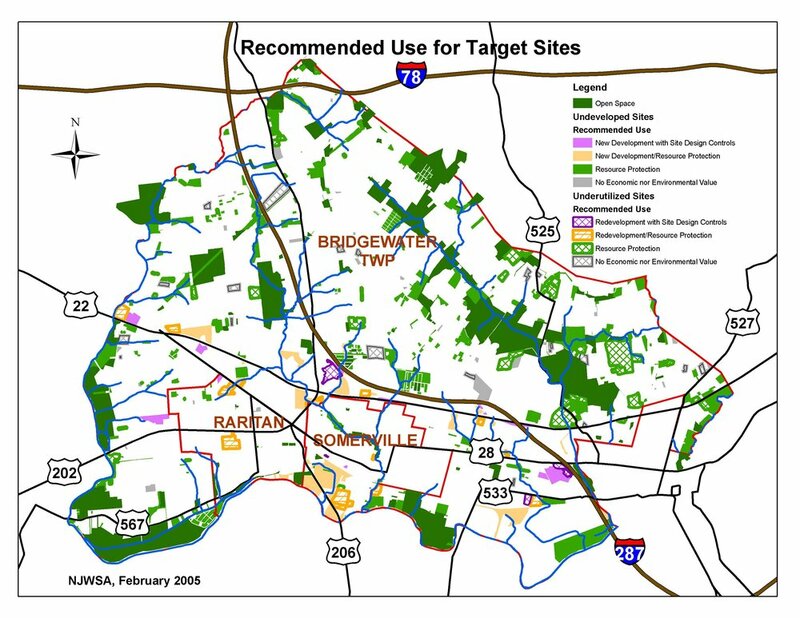 The Somerset Regional Center was chosen to test the methodology and criteria due to its existing land use patterns, highly organized regional partnerships, availability of current GIS data, proximity to a significant freshwater intake (NJ American Water Company-Elizabethtown), and its location between the Raritan North and South Branch confluence and the Raritan-Millstone confluence. The Somerset Regional Center is comprised of part or all of Bridgewater Township, Raritan Borough and Somerville Borough, and was the first regional Center approved by the State Planning Commission. The three municipalities contain a total of 21,436 acres and 21,723 parcels of land. The methodology employed by this study has revealed that 5,431 (25%) of those parcels contain at least some environmentally critical land. Within this subset, 4,607 properties were occupied by existing buildings and uses that support the tax base of their host community. The remaining 824 parcels were found to be either undeveloped or underutilized. The hypothesis of this study is that some of these parcels are best suited for resource protection while others are suitable for some level of development. During the course of the study, several properties identified as suitable for development were indeed developed. The "River Park at Raritan" project depicted on the cover of this report is one example. Other properties, which met the criteria for protection, were found to be equally attractive to area open space and recreation interests and were purchased for preservation. This dynamic served, in a small way, to initially validate the methodology and criteria developed by the New Jersey Water Supply Authority (NJWSA).